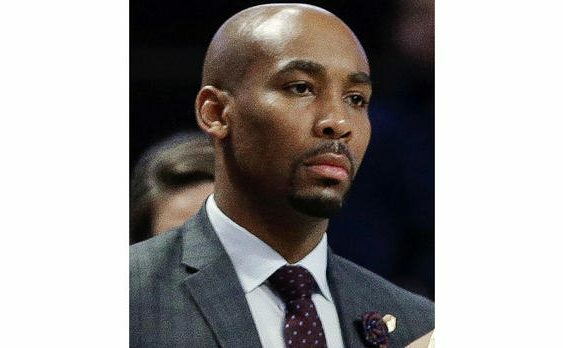 NEW YORK — A rising college basketball coaching star was accused of throwing a punch that killed a New York City tourist who had apparently mistaken the coach for an Uber driver. Wake Forest University assistant coach Jamill Jones pleaded not guilty Thursday to an assault charge. Jones attacked digital marketing guru Sandor Szabo around 1:15 a.m. last Sunday in Queens, police said. Szabo fell and smashed his head on the sidewalk. Szabo, visiting from Boca Raton, Florida, banged on the window of Jones’ SUV while looking for his ride after his stepsister’s wedding, police said. The coach got out, followed Szabo to the sidewalk, clocked him and sped off, police said. Szabo never regained consciousness and was taken off life support Tuesday. Josh Gillon, the CEO of the company where Szabo worked, told WABC-TV Szabo’s co-workers were shocked by his death. Jones, 35, of Kernersville, North Carolina, turned himself in to police Thursday, accompanied by a lawyer. He was arraigned Thursday night on a misdemeanor assault charge and released on his own recognizance after entering his plea. Wake Forest assistant coach Jamill Jones stands with the team during the second half of an NCAA college basketball game in Winston-Salem, N.C., Nov. 28, 2017. The coach’s next court appearance is scheduled for Oct. 2, the Queens district attorney’s office said. Jones was with his family after the court session, his attorney, Alain Massena, told The Associated Press. “This was a tragic accident, and Mr. Jones and his family send their deepest condolences and their thoughts and prayers to the Szabo family,” Massena said. In a statement, Wake Forest said the school would comment further once it gathered more information. Jones, a Philadelphia native, joined the Demon Deacons staff in May 2017 after coaching at Central Florida, Virginia Commonwealth and Florida Gulf Coast and playing at Arkansas Tech and North Platte Community College in Nebraska. Wake Forest head coach Danny Manning said at the time that Jones was a “well-respected bright mind” in the coaching world and brought “new blood” and “new perspectives” to Wake Forest. Szabo, also 35, was “super outgoing, friendly, and an incredibly smart businessman,” said his company, What If Media Group, based in Fort Lee, New Jersey. “He was always upbeat, positive, kind and caring,” the company said in a Facebook post.